If you need something with a little extra oomph from America’s top-selling external battery brand than those recently discounted Powerstation and Powerstation XL, Mophie has just unveiled the blazing fast Powerstation PD and Powerstation PD XL power banks ahead of next week’s Consumer Electronics Show in Las Vegas. As the names suggest, these bad boys are not that different from Mophie’s “regular” Powerstations, adding PD (Power Delivery) technology into the equation for up to 18W wired charging. The single USB-C port of the Mophie Powerstation PD and PD XL is purportedly capable of delivering juice to a compatible iPhone (XS, XS Max, XR, X, 8, and 8 Plus included) up to 2.5 times quicker than 5W chargers shipped by Apple as standard accessories. You’ll obviously need to separately purchase a USB-C to Lightning cable to get the new PD Powerstations to work their 18W magic, with Android devices naturally also supported via the aforementioned USB Type-C connector, as well as a USB-A port capping off at 12W rates. The “shared” USB-C PD input and output port is also used to power up the actual battery packs (at 15W speeds), with Priority+ functionality guaranteeing connected phones or tablets are juiced up first before the Powerstation itself starts to recharge. 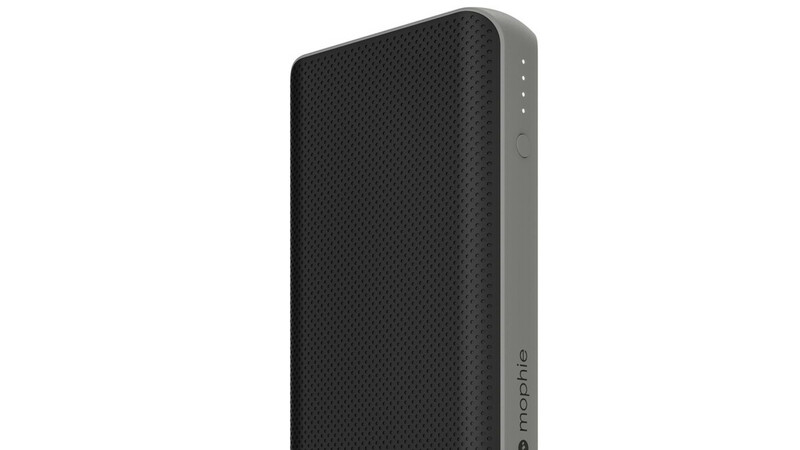 Finished with an elegant yet understated textured design for a “comfortable feel” and protection against scratches or scuffs, the Mophie Powerstation PD and Powerstation PD XL are certainly not cheap, selling for $59.95 and $79.95 through the company’s official website with 6,700 and 10,050 mAh capacity respectively. Otherwise put, the former is more than large enough to provide two full iPhone XS Max charges, while the latter should be able to get the iPhone 8 from 0 to 100 percent battery five times in a row without requiring a recharge of its own.